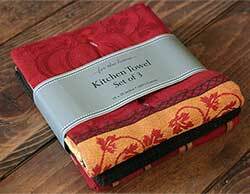 Fall kitchen towels to warm your kitchen for the season! 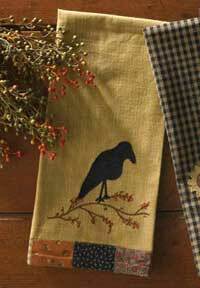 Leaves, sunflowers, turkeys, pumpkins and more on 100% cotton towels, great for kitchen decor or as hostess gifts! 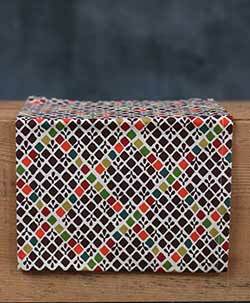 A subtle touch of fall decor for your kitchen, this white cotton towel is printed with an all-over diamond pattern in harvest colors. 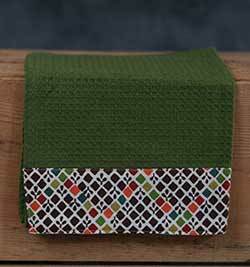 Made by Tag, ltd.
Moss green waffle weave cotton dishtowel, with a border of harvest-colored diamond pattern. 100% cotton, machine washable. 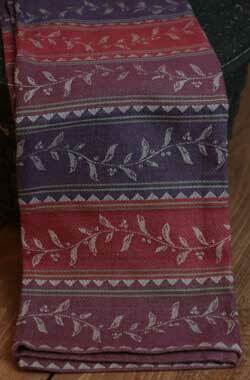 Jacquard weave towel in a color scheme of greens, burgundy, cordovan, beige and brown. Measures 18 x 26 inches. 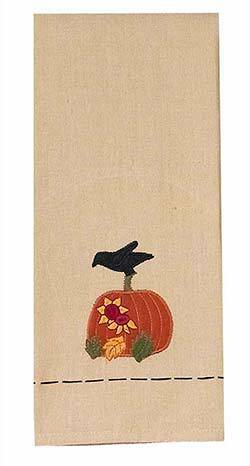 Add a touch of fall decor to your kitchen with this cotton towel in brown, tan, and pumpkin! 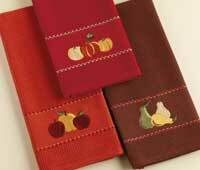 The Harvest Pumpkin Collection features a warm palette of pumpkin orange, cranberry red, cream, and chocolate brown. 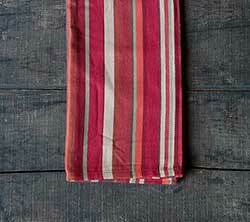 This is for the Stripe Dishtowel. 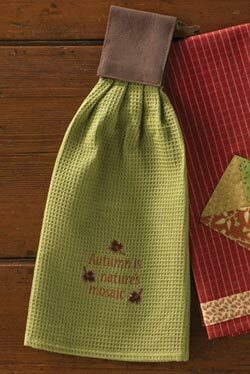 Leaves & Acorns Embroidered Waffle Weave Towel, by Tag. 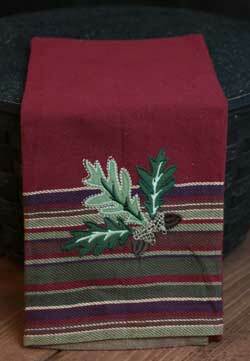 Black waffle weave dishtowel embroidered with colorful fall acorns and leaves. 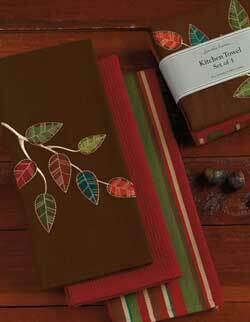 Chocolate brown woven cotton dishtowel with woven and dobby stitched border, and embroidered fall leaves. 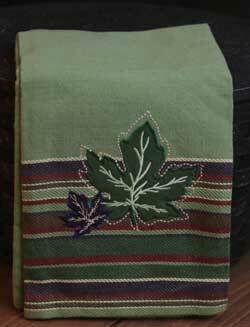 Maple Leaves Dishtowel, by DII. 100% cotton. The Autumn Leaves collection is beautiful in sage green, celery, plum purple, and burgundy striping, accented with a jacquard pattern of leaves. This is for the coordinating embroidered dishtowel, in the Maple Leaves. 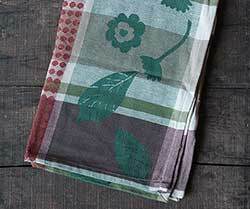 Features a solid pale celery green background edged with colored stripes, and embroidered maple leaves. Measures 18 x 28 inches. Machine washable. 100% cotton. 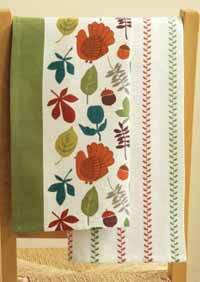 Nature Trail Pot Holder/Mitt Set, by Split P. The beautiful Nature Trail textile collection features earth tone colors, along with leaf and wood grain motifs, that are perfect pieces for autumn or all year round living. This is for the Pot Holder/Mitt Set - the Pot Holder features the colorful leaf pattern in burnt orange, browns, and teal, and the Oven Mitt features the brown and cream woodgrain pattern. Pot Holder is 8 x 8 inches, the Oven mitt is 7 x 12 inches. 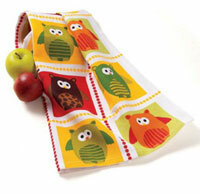 Owl Grid Dishtowel, by Tag. White cotton dishtowel printed with a colorful grid of cheerful owls! Part of the Fall Flora Collection. 100% cotton. Machine washable. Measures 20 x 28 inches. 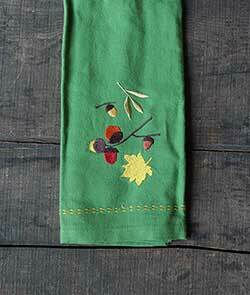 Pears Embroidered Dishtowel, by DII. 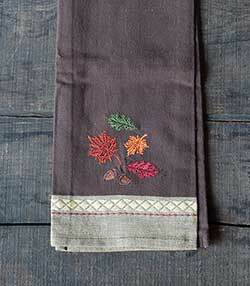 Chocolate brown cotton waffle weave dishtowel embroidered with pears (this is the right towel in photo). Measures 18 x 28 inches. 100% cotton. 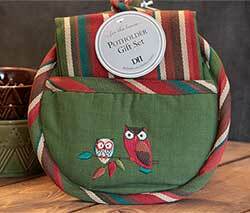 Other matching linens available! 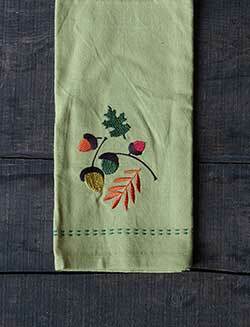 Pumpkin Spice Dishtowel, by Park Designs. The Pumpkin Spice Collection features a plaid of black, cream, and pumpkin oranges/mustard. 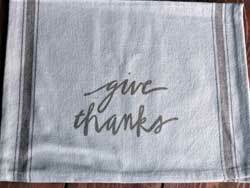 This is for the Dishtowel. Measures 19 x 28 inches. 100% cotton, machine washable. Other pieces also available! 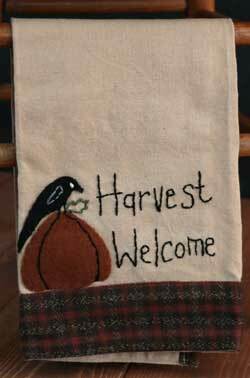 Pumpkin Spice Embellished Dishtowel, by DII. 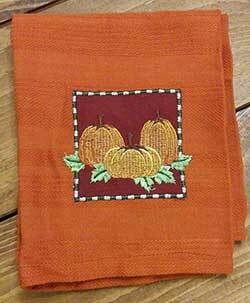 Rich pumpkin orange cotton dishtowel embroidered with leaves and pumpkins! Measures 18 x 28 inches. 100% cotton. Other matching linens available! Set of TWO dishtowels. One features a beautiful jacquard weave strip of golden sunflowers against a brick red background, on a creme towel. 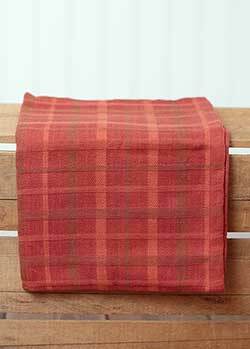 The other is a woven towel in a plaid of bittersweet, creme, and cream. 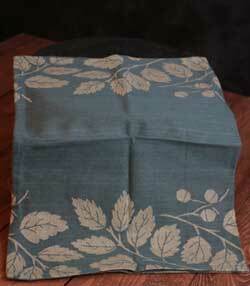 Beautiful jacquard towel in a lovely teal color, with woven leaf design - makes a great hostess gift, or fall decoration! 100% cotton. 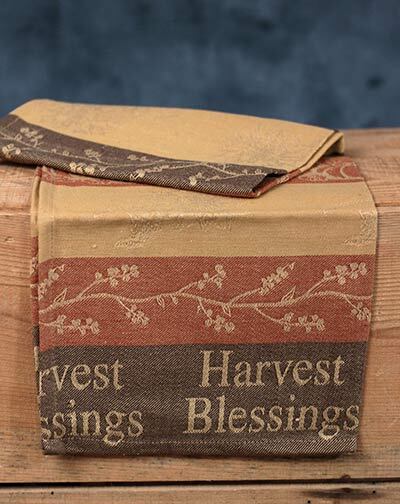 By Tag ltd.
Beautiful set of harvest-hued cotton dishtowels. 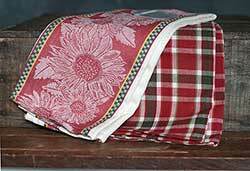 Includes a jaquard woven towel, a brown waffle weave towel, and a woven plaid towel. 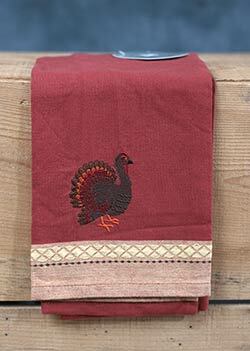 Great for thanksgiving, this russet brown cotton kitchen towel is embroidered with a colorful turkey. Inexpensive way to add a touch of fall to your home! 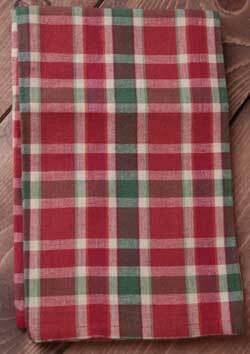 Tuscan Plaid Kitchen Towel, by DII. 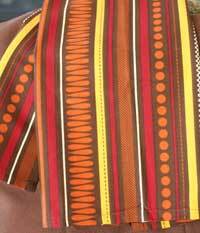 Features a woven plaid of burnt red, cream, and muted green. Great for a Tuscan kitchen, or fall decor!